News from The Associated Press With Republicans in command, their health care proposals as currently formulated have generated far more concern than enthusiasm. "Block granting" means the federal government would provide only a set amount to the states and the states would have to make up the difference if Medicaid costs rise. Under Ryan's version, the set amount would be set per person enrolled in Medicaid. Every analysis I've read or heard of says Medicaid spending would decline because states would not tax their residents more to make up for the reduced federal share. The Canadian blogger says Canada switched to a similar block-granting system several decades ago, but per capita spending did not decline because as federal spending declined provincial spending increased. He says the reason provinces picked up the slack is everyone is covered under Canada's system, while only the poor are covered under the US Medicaid program. Thus, all Canadian voters know they could be hurt by politicians who propose to cut provincial expenditures on health care, but all Americans cannot be hurt by cuts in Medicaid. Only the poor can be hurt by Medicaid cuts. "The most pressing question is: Why do we get such poor outcomes despite spending so much? The answer to this question is related to the extraordinary sums we spend on administrative costs in the U.S. compared to other industrialized countries." We need to remind ourselves that most people do not really know what single payer is. This can help with some basic facts. 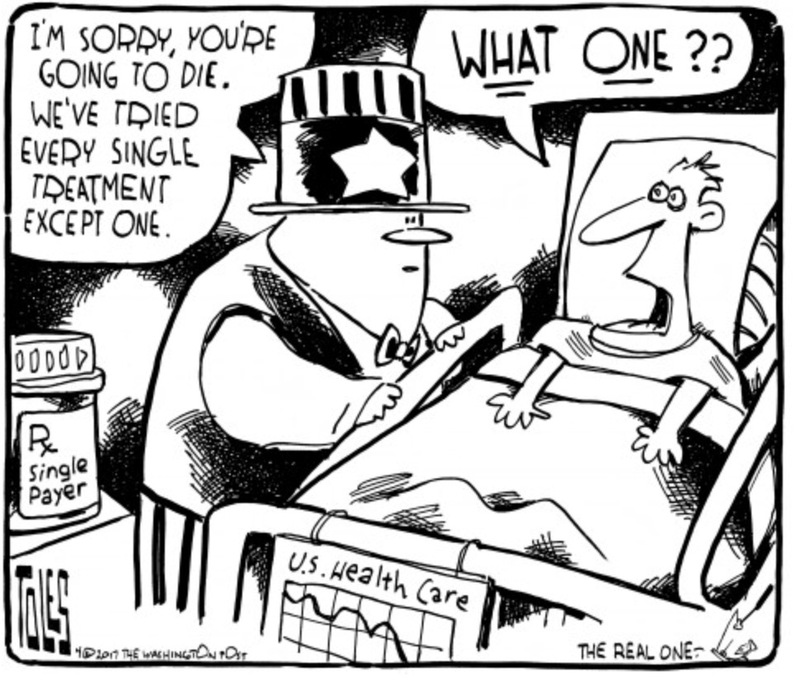 The intro: "Single payer, according to Physicians for a National Health Program, “is a system in which a single public or quasi-public agency organizes health care financing.” Under single payer, all residents of the United States would be “covered for all medically necessary services, including doctor, hospital, preventive, long-term care, mental health, reproductive health care, dental, vision, prescription drug and medical supply costs.” The program would be funded by savings derived by “replacing today’s inefficient, profit-oriented” insurance system, with “a single streamlined, nonprofit, public payer.” There would be no premiums, co-pays or deductibles and “95 percent of all households would save money.”"
EconoMonitor : Ed Dolan's Econ Blog » Universal Healthcare Access is Coming. Stop Fighting It and Start Figuring Out How to Make It Work. So many already covered. So much less expensive. So much money going from insurance companies to elected officials. Too bad the media calls this the health care "system" when what the articles really are referring to is the insurance coverage or how health care is paid for. The system of how health care is provided is not the major part of this. The doctors, hospitals and local pharmacies aren't the system being debated. It is how the bills are paid. And, right now way too much of the money (even in most states the public program money) goes to pay the insurance companies with their multi-million $ CEOs. Most health care is NOT a consumer product. All that paperwork vendors have to process for so many insurance companies costs a fortune. Single payer for the majority of us with concierge service for the rich 1% seems like a good model.